Discussion in 'General Discussion' started by timk, Jun 4, 2011. Since the untimely demise of the C43, I've been Merc-less. My 'temporary' stop-gap car, bought whilst waiting for the insurance payout, is an Audi A4 diesel, but worryingly, it's starting to look like a permanent fixture. 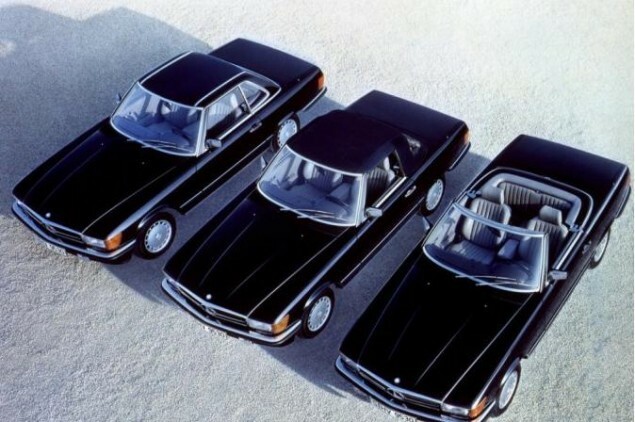 Lately though, the voices in my head have been urging me to buy an eighties 500SL. It's an itch I've always wanted to scratch - granted, there are a few other itches which need scratching, including an E39 M5, but the sun has come out and suddenly my favourite SL looks like an eminently appealing choice. Price disparity is huge though - I've seen an '86 500SL for £5k which has been in the same family for many years, is free of rot, and has history. Is this a good price?? Any pointers as to what I should look out for, apart from the obvious accident damage and usual 2nd hand car pitfalls? Any 107SL owners care to offer some insight? Not being hugely familiar with the Merc series numbers I had to Google for it. Rust and valve guides, and rust, and the hidden rust. If it really is rot-free and legitimate, then £5,000 is an absolute bargain. Any particular rust traps on these?? Sills, wings, floor? Or just everywhere? I think the one I'm referring to is in unrestored condition, but sounds like a good example. If I go and see it I'm going to poke a torch into lots of dark places and lift carpets, but any other advice as to what else to look at is welcome. After the C43, I'm not looking for a money pit, although I know these are never going to cost peanuts to run.. I'm no expert, but I believe the really crucial area is the bulkhead between the engine and cabin. I remember speaking to a guy who was quoting me for a respray back in the mid-1990s, and he had a lovely-looking R107 SL in his workshop. However, he told me it was only good for scrap, as the bulkhead and floor had gone, making it an uneconomic repair. Yes , the plenium chamber underneath those chrome air intakes just below the windscreen is notorious for rotting , then allowing water to penetrate into the cabin . This area is very difficult to repair due to inaccessibility . Other rusty areas like floorpan etc are no worse than any other car to fix . Check the carpets in the footwells , if any signs of dampness , check the bulkhead area very carefully - worth removing the trim above the footwell to get in for a good look . As above £5K is usually rustbucket money , good examples are still advertised at many times that price . Even very clean looking examples can have hidden rust and it is well worth getting an expert to examine a prospective purchase . Some 107 owners ( Druk or Silversaloon ) with much more experience of these cars than I have should be able to add some comment . Fantastic cars, it's my favourite car this time of year! But rust is the big killer. Sills, floors, boot floors, boot wells etc. I saw loads of frogs before I found my car. There is nothing really to know that hasn't already been said, the rust is easy to spot, just have a thorough poke around. Silver saloons restoration thread on here will give you some idea of the common weak points. If it's a V8 then valve stem seals can be an issue - blue smoke after pulling away from idle when hot. Not a small job. Also left exhaust manifold cracking is extremely common. I have replaced mine twice! My first one was repaired but it wasn't 100% so I've just bought a new one from mercedes. Good news is the price has come down from £450 to £250 now. Check the soft top. Cracks in the screen mean you may as well have a new hood at around £600-£800. I found that examples less than 15k were just tired so you will be doing well if this turns out to be any good! Strikes me this one is too cheap. This is restoration project money so be very careful. They cost a fortune to restore properly so much better to spend more on a good one. However you might be lucky. The R107's main claim to fame was by becoming one of the first examples of high-profile 'product placement' on TV , alongside several other MB models . This was done with the full co-operation of MB USA , who realised that hitherto MB cars were portrayed as the chosen transport of gangsters and villains . Ah 'der panzerwagen' , my favourite SL. 5k seems too cheap for a really good one though. IFFFFFFFFFFFFFFFFFFFFFFFFFFFFFFFFFFFFFFFFF!!!!!!!!!!!!!!!!!!!!!!!!!!!!!!!!!!!!! its rust free and priced at £5k its an absolute steal. BUT unless its been garaged/ comprehensively restored / kept abroad for many many of its 25 years--- RUST will have had its evil way. The one I referred to in the OP looked like too much of a bargain - and something with the ad or car may have been iffy - I tried several times to get in touch with seller but never any response. I've since become more attracted to the 500/560 SEC though - still have the over-engineered 80s Merc feel that I like, and are seemingly better value. The 560 is not far off the C43 on power either, although a different animal. Finding an original one at the right money, which hasn't been chavved with chrome arches or stupid spoilers is the hard part though. How about an R129? Solid, fast, don't rust anywhere near as much as the R107's and generally a joy to live with. Very true - bit more blokey than the R107, but it just looks sad from the front.